Some years my late winter days are full and I don’t begin my own tomato plants from saved seed of my favorite varieties. This year I sorted through my tomato seeds and planted these tomatoes: Black Cherry, Black Krim, and Stupice. Some of the seeds were five years old and I was uncertain of their viability. I sowed liberally and gave the extra seedlings to San Diego Seed Company for trials in their gardens. When I plant my seed-grown tomatoes in the garden I’ll add a San Marzano grown by a friend and a purchased Early Girl. Lettuce is easy to grow in my winter garden but success has eluded me in the summer months. The birds find the seedlings in the late spring and summer, germination with direct seeding has been suboptimal and lettuce bolts sooner than I’d like. Most years I don’t try to grow lettuce in the summer garden, even in the shadier areas. 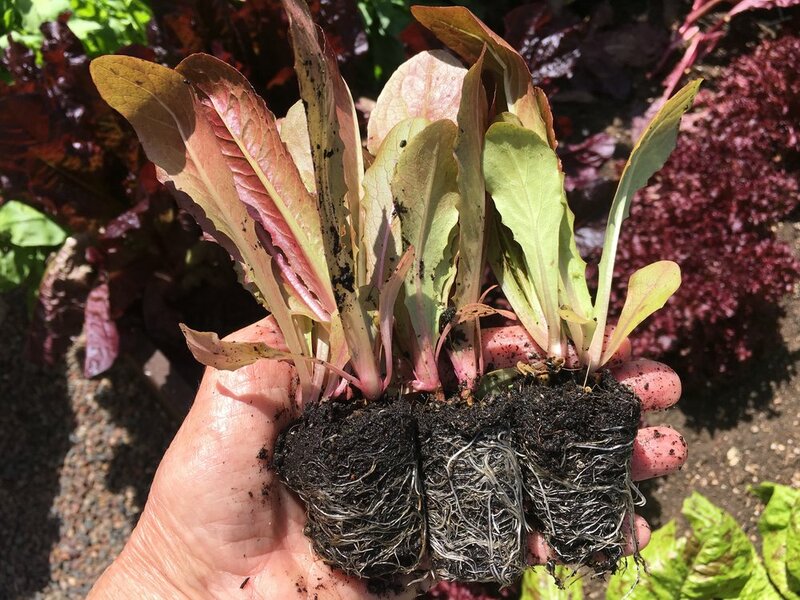 With the seed of proven varieties of summer lettuce gathered in, I decided to give summer lettuce another try, growing my own transplants from seed. Jericho, originally developed in Israel, is an heirloom romaine that is especially heat-tolerant. Organic seed is available from Johnny’s, Renee’s Garden and HIgh Mowing and other seed purveyors. I also planted Cimarron, a lovely red romaine heirloom from the 1700’s that is slow to bolt. It’s available from Pinetree Garden Seeds and Gardens Alive!. I also sowed seed from a Summer Lettuce Blend. Today, I transplanted some of the unthinned, double seedlings to the garden along with others growing in larger cells. This year, I’m planting the lettuce in the tomato bed. As the tomatoes grow and the weather warms, in theory, the tomatoes will provide shade to the summer lettuce. Gardening is about experimentation. If you’re new to growing vegetables from seed for transplantation to the garden you’ll find excellent advice at Mother Earth News on Transplanting Seedlings. Final acts after planting protect the coddled transplants from marauding birds and a opossum which has frequented our yard in the last month. Since the afternoon was warm and it was expected to be sunny the next day, these garden trays shaded and protected the transplants. I’ll remove them after two days, depending on the weather, and add more wire screening over the top of the raised bed. Give it a try. Growing your own transplants from seed expands your choices of varieties to grow, saves money and is rewarding.